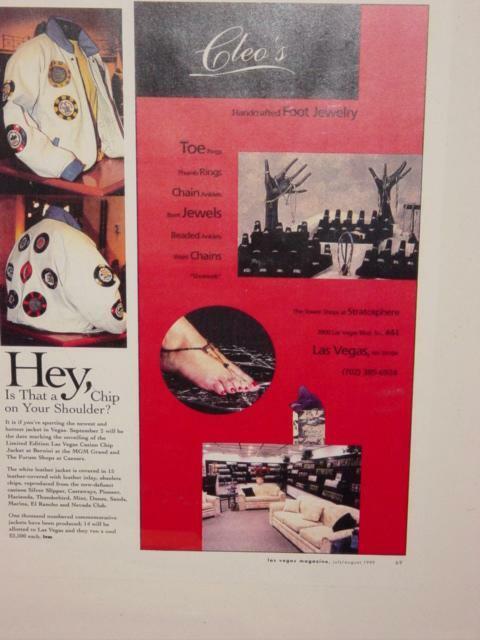 Limited Edition Las Vegas Casino Chip Jacket sells at Bernini for $2500 a pop. 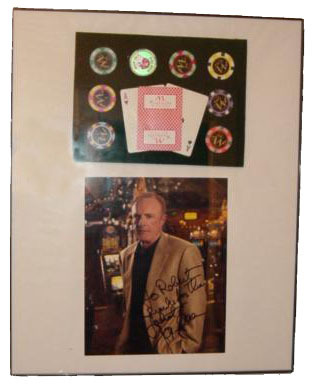 James Caan thanks Robert Schiloni for the Limited Edition Casino Chip leather Jacket and sends him some prop chips from The Montecito Casino from the NBC hit TV show Las Vegas. Checks Play Casino Fashions helped the St. Jude's Radio-thon raise more than $273,000 at the Galleria Mall In Las Vegas, Nevada on February 22nd and 23rd 2001. 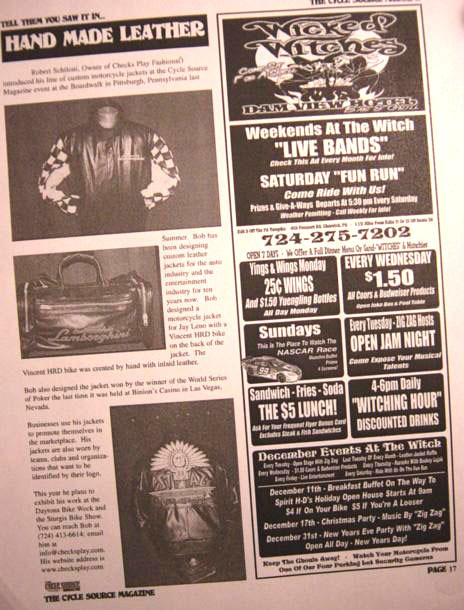 The historic custom leather Desert Inn jacket which was one of a few ever made was donated by Checks Play Fashions. is from the personal collection of Robert Schiloni. 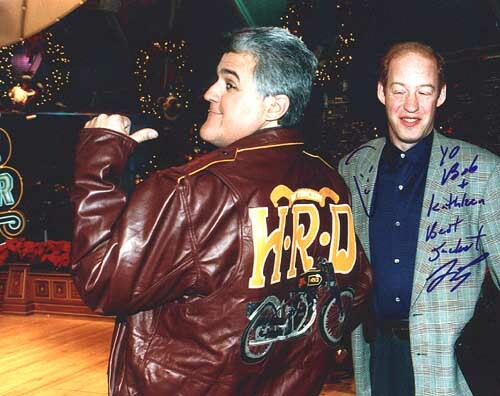 Jay Leno and President of Checks Play Casino Fashions Robert Schiloni shake hands after Jay accepts a custom-made leather jacket as a Christmas present after the show. The jacket has an inlaid Vincent HRD on the back. Las Vegas Mayor Oscar Goodman received a custom leather jacket at Bernini of Las Vegas at the famous Forum shops on September 11, 2000. Made by designer Robert Schiloni, President Checks Play. The jacket has the city's logo inlaid in Italian Lambskinand features a 24 gold plated Riri zipper imported from Switzerland. 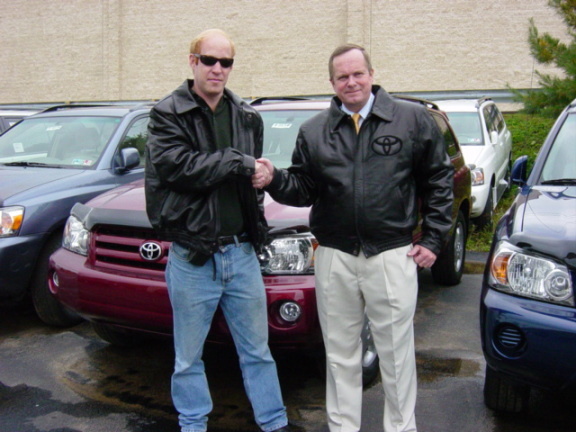 Robert Schiloni of Checks Play delivers a custom leather jacket to the president of a local Toyota dealership. 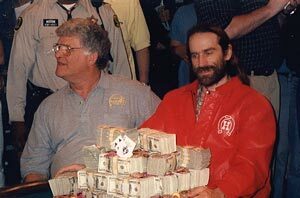 Chris Ferguson won the prestigious Championship No Limit Hold'em main event at the 2000 World Series of Poker. He beat another top competitor, TJ Cloutier. The final hand of the series was one that will be remembered. TJ held AQ to Ferguson's A9. 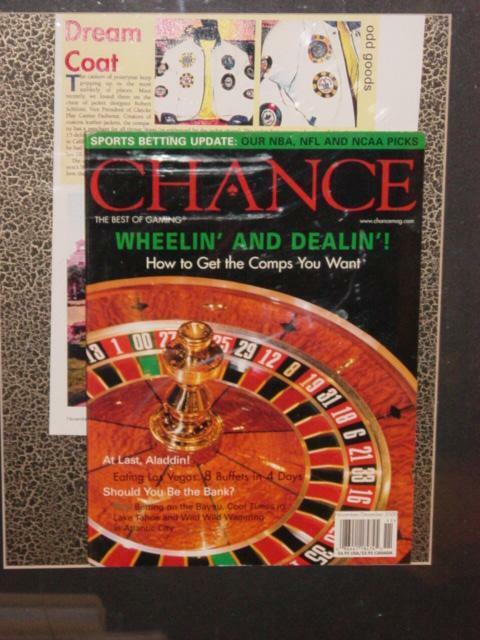 The flop came 2K4 with a King on the turn. If the board paired, the pot would have been split and Ferguson would have been saved, but if the 9 came the tournament would be all over. The 9 came and Ferguson was World Champion. Chris Ferguson was given the 2000 WSOP custom leather jacket . 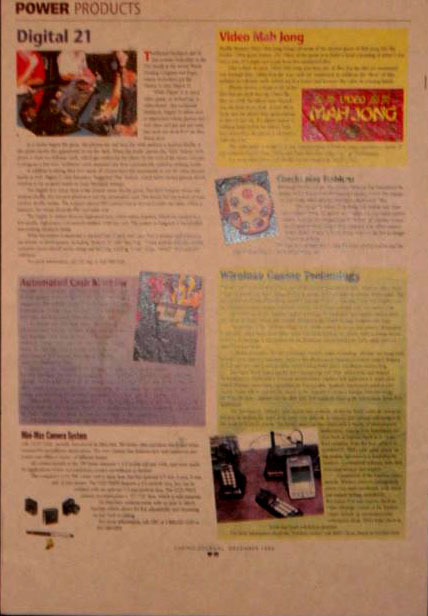 The jacket was designed by Checks Play Fashions.